The front of CityGo buses look different. Bike racks have been installed and bicyclists have been able to “stow their bike and go” since Monday. In the past, riders with bikes, wheelchairs and strollers competed for space in the back of the bus. CityGo used to have a policy that bikes were removed if a rider with a handicap was waiting. However, some cyclists also have handicaps. Riders will have to put their own bikes on the racks. Once a destination is reached, they will have to remove their bike and then they are on their way. One bike rider used the bike rack twice on Monday. The bicyclist had duct taped and bungee corded a boom box to his bike; the City Go driver was a little nervous as the bus crossed train tracks. The bike reached its destination intact. 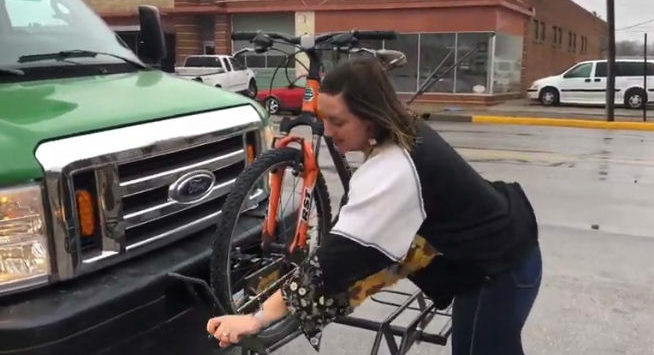 CityGo and the City of Salina are working in partnership to bring “rental bikes” to Salina.